King of Great Britain and Ireland, second surviving son of King Charles I and Henrietta Maria, was born at St. Jamess on the 15th of October 1633, and created Duke of York in January 1643. During the Civil War James was taken prisoner by Fairfax (1646), but contrived to escape to Holland in 1648. Subsequently he served in the French army under Turenne, and in the Spanish under Condé, and was applauded by both commanders for his brilliant personal courage. Returning to England with King Charles II in 1660 he was appointed lord high admiral and warden of the Cinque Ports. Samuel Pepys, who was secretary to the navy, has recorded the patient industry and unflinching probity of his naval administration. His victory over the Dutch in 1665, and his drawn battle with De Ruyter in 1672, show that he was a good naval commander as well as an excellent administrator. These achievements won him a reputation for high courage, which, until the close of 1688, was amply deserved. His private record was not as good as his public. In December 1660 he admitted to having contracted, under discreditable circumstances, a secret marriage with Anne Hyde (1637-1671), daughter of Lord Clarendon, in the previous September. Both before and after the marriage he seems to have been a libertine as unblushing though not so fastidious as Charles himself. In 1672 he made a public avowal of his conversion to Roman Catholicism. Charles II had opposed this project, but in 1673 allowed him to marry the Catholic Mary of Modena as his second wife. Both houses of parliament, who viewed this union with abhorrence, now passed the Test Act, forbidding Catholics to hold office. In consequence of this James was forced to resign his posts. It was in vain that he married his daughter Mary to the Protestant Prince of Orange in 1677. Anti-Catholic feeling ran so high that, after the discovery of the Popish Plot, he found it wiser to retire to Brussels (1679), while Shaftesbury and the Whigs planned to exclude him from the succession. He was lord high commissioner of Scotland (1680-82), where he occupied himself in a severe persecution of the Covenanters. In 1684 Charles, having triumphed over the Exclusionists, restored James to the office of high admiral by use of his dispensing power. 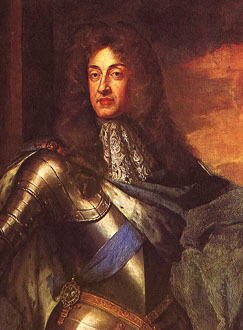 James ascended the throne on the 16th of February 1685. The nation showed its loyalty by its firm adherence to him during the rebellions of Argyll in Scotland and Monmouth in England (1685). The savage reprisals on their suppression, especially the "Bloody Assizes" of Jeffreys, produced a revulsion of public feeling. James had promised to defend the existing Church and government, but the people now became suspicious. James was not a mere tyrant and bigot, as the popular imagination speedily assumed him to be. He was rather a mediocre but not altogether obtuse man, who mistook tributary streams for the main currents of national thought. Thus he greatly underrated the strength of the Establishment, and preposterously exaggerated that of Dissent and Catholicism. He perceived that opinion was seriously divided in the Established Church, and thought that a vigorous policy would soon prove effective. Hence he publicly celebrated Mass, prohibited preaching against Catholicism, and showed exceptional favor to renegades from the Establishment. By undue pressure he secured a decision of the judges, in the test case of Godden v. Hale (1687), by which he was allowed to dispense Catholics from the Test Act. Catholics were now admitted to the chief offices in the army, and to some important posts in the state, in virtue of the dispensing power of James. The judges had been intimidated or corrupted, and the royal promise to protect the Establishment violated. The army had been increased to 20,000 men and encamped at Hounslow Heath to overawe the capital. Public alarm was speedily manifested and suspicion to a high degree awakened. In 1687 James made a bid for the support of the Dissenters by advocating a system of joint toleration for Catholics and Dissenters. In April 1687 he published a Declaration of Indulgence -- exempting Catholics and Dissenters from penal statutes. He followed up this measure by dissolving parliament and attacking the universities. By an unscrupulous use of the dispensing power he introduced Dissenters and Catholics into all departments of state and into the municipal corporations, which were remodelled in their interests. Then in April 1688 he took the suicidal step of issuing a proclamation to force the clergy and bishops to read the Declaration in their pulpits, and thus personally advocate a measure they detested. Seven bishops refused, were indicted by James for libel, but acquitted amid the indescribable enthusiasm of the populace. Protestant nobles of England, enraged at the tolerant policy of James, had been in negotiation with William of Orange since 1687. The trial of the seven bishops, and the birth of a son to James, now induced them to send William a definite invitation (June 30, 1688). James remained in a fool's paradise until the last, and only awakened to his danger when William landed at Torbay (November 5, 1688) and swept all before him. James pretended to treat, and in the midst of the negotiations fled to France. He was intercepted at Faversham and brought back, but the politic prince of Orange allowed him to escape a second time (December 23, 1688). At the end of 1688 James seemed to have lost his old courage. After his defeat at the Boyne (July 1, 1690) he speedily departed from Ireland, where he had so conducted himself that his English followers had been ashamed of his incapacity, while French officers had derided him. His proclamations and policy towards England during these years show unmistakable traces of the same incompetence. On the 17th of May 1692 he saw the French fleet destroyed before his very eyes off Cape La Hogue. He was aware of, though not an open advocate of the "Assassination Plot", which was directed against William. By its revelation and failure (February 10, 1696) the third and last serious attempt of James for his restoration failed. He refused in the same year to accept the French influence in favor of his candidature to the Polish throne, on the ground that it would exclude him from the English. Henceforward he neglected politics, and Louis of France ceased to consider him as a political factor. A mysterious conversion had been effected in him by an austere Cistercian abbot. The world saw with astonishment this vicious, rough, coarse-fibred man of the world transformed into an austere penitent, who worked miracles of healing. Surrounded by this odor of sanctity, which greatly edified the faithful, James lived at St. Germain until his death on the 17th of September 1701. The political ineptitude of James is clear; he often showed firmness when conciliation was needed, and weakness when resolution alone could have saved the day. Moreover, though he mismanaged almost every political problem with which he personally dealt, he was singularly tactless and impatient of advice. But in general political morality he was not below his age, and in his advocacy of toleration decidedly above it. He was more honest and sincere than Charles II, more genuinely patriotic in his foreign policy, and more consistent in his religious attitude. That his brother retained the throne while James lost it is an ironical demonstration that a more pitiless fate awaits the ruler whose faults are of the intellect, than one whose faults are of the heart. By Anne Hyde James had eight children, of whom two only, Mary and Anne, both queens of England, survived their father. By Mary of Modena he had seven children, among them being James Francis Edward (the Old Pretender) and Louisa Maria Theresa, who died at St. Germain in 1712. By one mistress, Arabella Churchill (1648-1730), he had two sons, James, Duke of Berwick, and Henry (1673-1702), titular Duke of Albemarle and grand prior of France, and a daughter, Henrietta (1667-1730), who married Sir Henry Waldegrave, afterwards Baron Waldegrave; and by another, Catherine Sedley, Countess of Dorchester (1657-1717), a daughter, Catherine (d. 1743), who married James Annesley, 5th Earl of Anglesey, and afterwards John Sheffield, Duke of Buckingham and Normanby.